One of my favorite treats at Walt Disney World is Dole Whip. Actually it’s one of many favorite treats at Walt Disney World. I didn’t find the exact recipe for Dole Whip but I found one that was close enough to satisfy the craving for Dole Whip. There is a place 20 minutes from my house that sells Dole Whip so when I have the real urge to have some, I’ll go there and pretend I’m at WDW. Blend until smooth. If needed, add more milk (1 Tbsp. at a time). Okay the title of this blog is a little misleading. You make the dough in the bread machine but then remove the dough to bake the bread. I was able to start the dough before we left for church and then make it into a loaf when we got home. Easy peasy! As I have said previously, there are a few items that I cannot cook to save my life. Hard boiled eggs are one of those items. I’ve shared my technique for making them in the oven. This is my technique for making the hard boiled eggs in my pressure cooker. I’m not going to be posting any weekly menus for the next three weeks. We are currently just eating out of the freezer because I have a lot of food stock piled in the freezer. Hubby expressed his concern with the amount of food we have in there so I’m going to be use some of the food up. Plus there is another reason I’m not going to menu plan but I won’t discuss it until a later time. 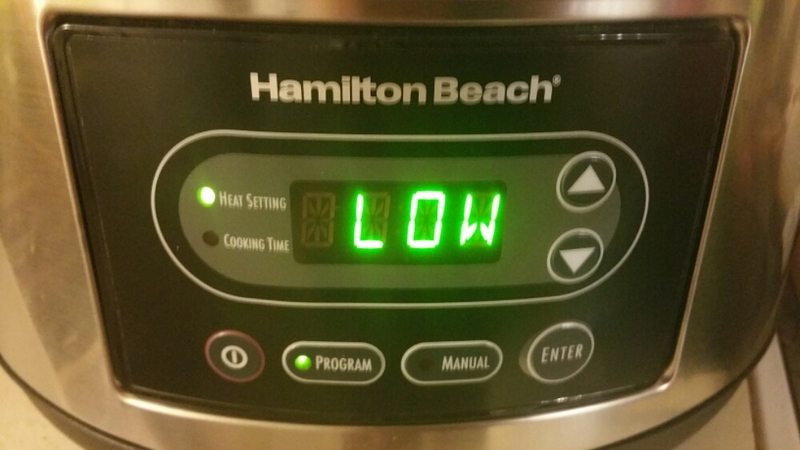 Hubby and I are having issues with using the slow cooker for our dinners because he is either forgetting to turn it on low when he’s been asked to do it by me or I make the mistake of turning it on high instead of low because I think I’m using one crock pot but I’m using another crock pot. Don’t ask. Anyway after our last issue with the crock pot, I went on Amazon and got us a new crock pot that is digital. Sweet! I already have one that has the automatic timer. The problem is that it is huge and it only gives me two choices for the low temperature and two choices for the high temperature. 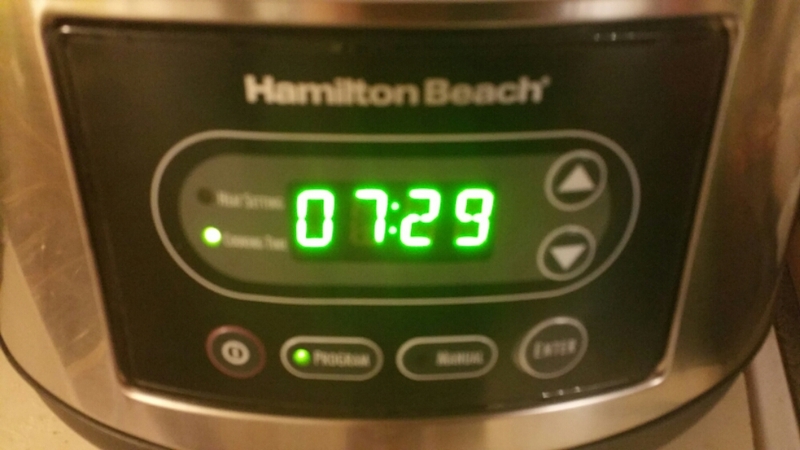 With this crock pot I can set the exact time I want and whether I want it to cook on low or high. Here is a link to my new crock pot. I’ll share my impressions of it after using it for a while. This is an easy recipe for breakfast. You prepare it the night before and put in the fridge. The next morning, you pull it out of the fridge and then set it on the counter to allow for the oats to warm up a bit. That is unless you love the oats ice cold. This is a versatile recipe. You can change it up depending on your imagination. I’m sharing you a version that uses blueberries and strawberries. The oatmeal is then topped with pecans. Combine the oats, milk, blueberries, strawberries, honey, chia seeds, and cinnamon in a jar. Take out of the fridge and allow to take the chill off. Can you believe Easter is almost upon us? Neither can I.
I decided I wanted ham the other day for dinner. Instead of cooking it the typical way in the slow cooker, I decided to cook it it with apple cider. The Wee One told me that the ham tasted like applesauce. The Imaginative One took a huge slice and ate it all. I believe that this recipe is a keeper. Place the ham in the slow cooker. Pour apple cider or apple juice over the ham. In a small bowl, combine the brown sugar, cinnamon, and cloves. Pat the mixture on the ham. Spring is upon us. I crave more salads during spring. Maybe it’s my body craving something healthy after the heaviness of winter dishes. Anyway this is one yummy simple salad. I dressed it with maple Dijon vinaigrette but it would be equally delicious with the blueberry vinaigrette or grapefruit vinaigrette. Toss the spinach, blueberries, almonds, goat cheese, and chicken if you are using it. As I said, I’m trying to post more salad dressing recipes on my blog. I went to Pinterest to see if I could find any ideas of salad dressings. This one is yum! Simple and delicious. I could have licked the bowl after eating the salad. However, that might have looked a little silly. Instead of ordering Chinese food from our local restaurant, I decided to make us homemade Chinese food. Whenever I do, Hubby tells me it’s better than the mall’s food court Chinese food. He loves to go get lunch there on occasion. It’s super easy to put together. The flavor is phenomenal! Hubby and the Wee One really enjoyed the dish. In fact, in the middle of dinner, the Wee One announced dinner was “yummy.” I’ll take that compliment. I found frozen ginger cubes at Walmart a few weeks ago. Each cube is worth 1 tsp. of minced ginger. I used the minced ginger in this dish. It made getting dinner on the table so much easier. I also use the already minced garlic. We get a huge container at Sam’s Club. As I said, it makes getting dinner on the table quicker. Here’s another tip to help you with dinner: I bought a big bag of frozen chicken tenderloins. The frozen chicken tenderloins were cheaper than buying fresh chicken. On the day I was going to use the chicken, I pulled out the amount of chicken needed for dinner. I then put it into the fridge to thaw out for dinner. Since it was not completely thawed out when I went to use it, it was so much easier to cut. In a medium skillet, heat the oil. Add the ginger and garlic. Heat for 1 minute. Add the chicken. Cook for 5 minutes or until the chicken is browned. Add the Hoisin sauce, chicken broth, lime zest, and lime juice to the chicken. Turn the heat up to high. Allow the mixture to boil. Turn the heat to medium low. Allow to simmer for 8 to 10 minutes or until the chicken is completely cooked. Add the cashews and green onions. This is another weird week for our dinners. Monday, Tuesday, and Friday are pretty normal dinnerwise. However, Wednesday and Thursday are going to be different. On Wednesday, we have Lenten soup supper at church so we are eating there. On Thursday, we have pictures at church. I won’t have time to go home and get supper on the table before Hubby has to go to work so we are planning to go out to dinner.